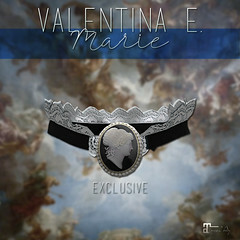 March 2016 – Valentina E.
NEW! Rosa Vintage Lace Robe @ UBER! NEW! Valentina E. Dark Victory Dress @ The Fantasy Collective! NEW Valentina E. Dark Victory Dress exclusively at The Fantasy Collective opening March 22nd! This stunning silk dress features full, semi-sheer chiffon sleeves, buttoned cuffs, and a daring, plunging back! Available in Maitreya Lara, Slink Physique/Hourglass and Standard Small/Medium sizes. Don’t miss it! NEW! Valentina E. Bronwyn Dress @ Shiny Shabby! Coming March 20th exclusively to Shiny Shabby the new Valentina E. Bronwyn Dress! Available in crochet and lace, both with four color options. Maitreya Lara, Slink Physique/Hourglass, and Standard Small/Medium sizes included. NEW! Valentina E. Hey Sailor Ensemble @ The Mesh Body Addicts Fair! NEW! 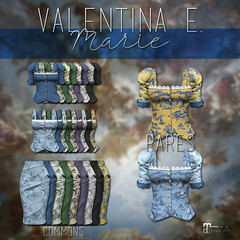 Valentina E. Hey Sailor Bodysuit & Leggings out exclusively for Maitreya Lara at The Mesh Body Addicts Fair here! NEW! Lilly Dress @ On9! NEW! Valentina E. Lilly Belted Dress exclusively at On9 opening March 9th! NEW! Valentina E. Bamboo Dress @ FaMESHed! NEW @ FaMESHed March 1st the new Valentina E. Bamboo Dress featuring a reptile belt, and multi strap details. Available in four color options with Maitreya Lara, Slink Physique/Hourglass, and Standard Small & Medium sizes. Don’t miss it!